Apart from the obvious, it's a pet, there's something special - it is an EPIC quality pet, meaning the bird from stranglethorn may have some competition for rarest now - in addition, the pet, like the other epic pet, is NOT marked as bind on pickup. I sense farming and money being the two things associated with this pet. Edit: At the time this post was made, the pet was not bind on pickup nor BOA. this has since been changed, and the pet is now bind-on-account. actually these will most likely be bop and might not be epic since all the weapons in archeology are boa but appear epic on this data base. but so far the beta archeology tree indicates ALL items in archeology will either be BoA or BoP no BoEs. Just by the name alone, all I can think of is Thing from Addams Family. So...if we go afk too long in a dungeon will this pick us up and take us to the begining? This is going to be the most awesome pet in Cataclysm. But have to say it's not going to be the most awesome of all time because of Willy. The first thing I thought of after seeing this: Legend of Zelda. maybe its just me but im curious about that things ring, i would assume if it belonged to a Djinn it wouldn't be mundane. I'm strangely reminded of the hand from the Zelda games, hopefully when it grabs you it ports you to your hearth rather than the beginning of the dungeon. Actually, if you look at the tooltip, it's bind on account. So there will be no farming for selling for this item. Azshara's gown is the same from what I've seen. Not sure yet how many of the rewards bind to account. what a handsome pet, I know it will become handy once! Reminds me of an awesome horror movie named Idle Hands. I hope its just as evil! I got this today as my 51st Tol'vir artifact and fourth rare Tol'vir artifact. 51 artifacts doesn't sound like much, but the scarcity of Tol'vir digsites made it take an extremely long time. As others have said, it's BOA, but unfortunately disappears upon first use. It's definitely a cool-looking pet. When you walk, it walks forward on its index and middle fingers, and when you run, it bounds forward on all fives. Could be a reference to the movie The Crawling Hand a 1963 SciFi Movie or the possessed hand in Evil Dead 2. There's a joke in this about one-handed-wow... just too tired to think of it. The Crawling Claw is a unique companion pet, meaning that no other pet shares the same model. This moves on its index and middle fingers and will sometimes jump up and do rock, paper, scissors, or do a 'thumbs up' animation. The Crawling Claw can be created by archeologists once they reach skill level 450. In order to create this artifact you must gather 150 Tol'vir fragments from Uldum and you may use up to three keystones to reduce the amount of fragments needed by 36 (12 x 3). Being a huge pet collector, this pet is rough. Tol'vir digsites hardly ever pop up for me, nevermind hoping a Rare queues in the Arch profession, and hoping its this one! Sheesh. Not giving up though. But the grind is rather bad. No one has bothered to point out that this pet is BoA BUT it is still consumed when used as of Jan 21. This makes it unlike Mr. Chilly where you could learn it on all your characters. While you are free to learn it with a different character, you can only learn it on ONE character, so choose carefully. Managed to aquire the pet after around 55 solves. After having done recently a gathered 20 solves and getting nothing but vendor items and being in the verge of ditching archaeology until a major future drop-rate patch, i gathered my patience again and went for it. Kept gathering fragments till i had enough for around 15 solves and went for it. It seems to follow the pattern of Ring -> Scarab -> Pet -> Mount, even though a friend of mine reported getting the mount as his first rare of Tol'vir. For some reason, this remind me of Zelda ocarina of time. In forest temple there were hands hanging in the floor, trying to grab you when u entered. Not saying its a referance tho. I don't think there's really an order for the rares. I got pendant, then ring, then pet so far. Have yet to see the mount. 34 solves for the pet to pop. There is no order for rares. My order for Tol'vir so far: Ring > Scarab > Staff. Mount is obviously what I want the most, this pet being the second most sought-after item. "Hands down".... one of the best companions. Oh man, I crack myself up. I want to update WoWpedia's unsolved text of this artifact. So is there anyone who completed Crawling Claw able to post the unsolved texts? Scarab>Ring>Crawling Claw so far. This was my 108th Tol'vir solve. I just got this on my priest Cascade Terenas EU, not sure whether it's realm first or not. But just to let you know that in order for the pet to perform the rock, paper and scissors animation someone else must have a Crawling Claw pet summoned. Will no longer be Bound to Account as soon as Patch 4.1 hits. Whats your source? Because that would be complete BS/crap if they removed the BoA on this Archeology item. When next to someone with a Crawling Claw, your pets will eventually play rock, paper, scissors until one of them loses. The loser blows up and the winner gives a thumbs up. 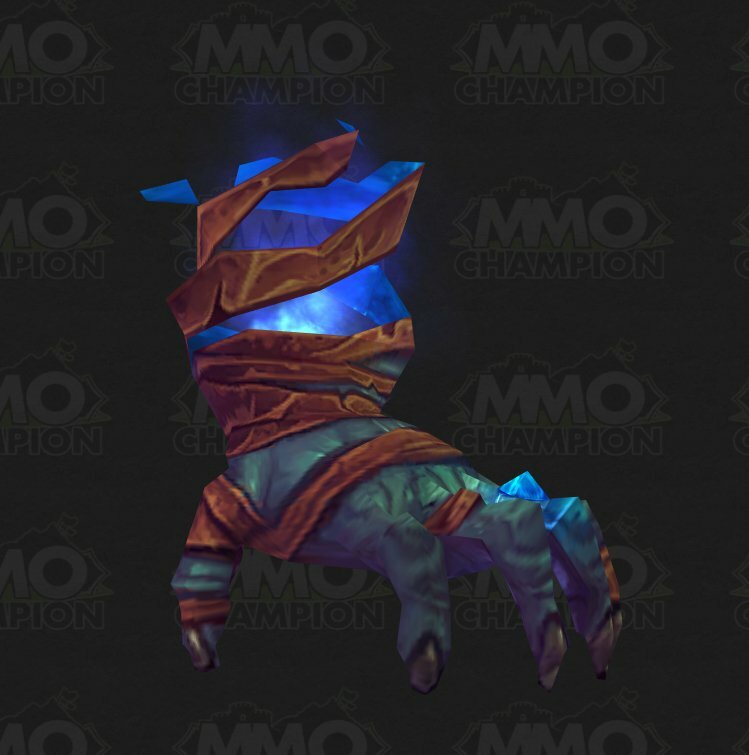 Oddly enough the Archaelogy page for it on my professions tab still calls it a Mummified Monkey Paw and has a completely different flavour text explanation to that of the spell listed in Wowhead for Crawling Claw. 100th Tol'vir solve. Got ring first, then scarabs, then the battle tank ... this was #4. My rares were ring -> pet -> scarabs, so maybe the pet comes in randomly but fairly early. I have not gotten the ring or mount but I have gotten the pet. It must be random. I got this item from completing the Mummified Monkey Paw relic of the Tol' Vir. As of this date the pet is still Bind on Account. For me it was pendant -> ring -> bug mount -> ? patch 4.1 - now it should be much easier to find this hand-pet (and other rares you need) - "Players now have a much smaller chance of getting a dig site for a race for which they have completed all rare finds". Alternatively, one could play Cockroach, Foot, Atomic Bomb. Foot squashes Cockroach, Atomic Bomb annihilates Foot, and Cockroach survives Atomic Bomb. It's a little easier than normal because Atomic Bomb always wins. Unless you play Cockroach... scratch that, Cockroach always wins. For me it was Pendant -> Mount -> Ring -> Staff -> still trying to get pet. This was my third rare Tol'vir project and my 147th Tol'vir solve. I know that many people find comments about when someone got an item to be utterly useless. I, however, felt encouraged every time I read a comment about when someone actually got this project to pop. It's completely random when you get this project, and it might be a really long time until it finally does. Just keep digging! Reminds me of the hand from Legend of Zelda: A Link to The Past... The one that grabs you and brings you to the dungeon entrance. Decided to grind out my archaeology tonight. Went from 300-525. I mostly just want to get the mount but any BoA epics along the way won't hurt. Kept farming until my first tol'vir rare popped. My 5th project came up with this. I'll finish getting the fragments for it tomorrow. Good luck farming and hang in there. Wish me luck on the mount grind. 100 Solved, have not seen this yet. Just popped as 50th Tol'vir solve. yay. I expected much longer farm for this one. I got the pendant - ring and now this cute little companion. you know qutie a lot of lore for a quite new faction. where you saw that? 41st solve this pet dropped. If you and your friend, enemy, or whomever have this 'pet' out at the same time. It will preform the good old Stone, Paper, scissor game. The winner with make the loser explode, and will do a Thumbs Up emote! I hate archaeology, but I have 149 companions now. Without it I can't get Celestial Dragon. Ring of Boy Emperor > Pendant of Scarab > Scepter of Azj'Aqir > Scimitar or Sirocco. I have completed 134 Tol'vir commons and 4 Tol'vir rares. Got my fingers crossed for the pet... HAPPY DIGGING! Edit: FINALLY got this after 201 Tol'vir Artifacts completed, woot! Shows up in your archaeology tab as "Mummified Monkey Paw"
"This appears as nothing more than the paw of a small primate. A closer inspection shows that the hand has been dried by centuries of exposure to the sands of Uldum. Still, you have no doubt that it is far more than meets the eye." The walking animation is very... sassy. this actually reminds me a little bit of a d&d campain i am playing. my wizard has a dismembered hand for a familiar. i just wonder if it will be able to fight as well as in d&d when the next expansion comes out. if nothing else it can probably grab its opponent. A friend of mine just got the pet after 141 Tol'vir artefacts. So let's do some math. 5x20=100, 100+(4x5)<=>100+20=120. So it'd take about 120 minutes (2 hours) to get a full set 4 Tol'vir digsites. With 4 digsites, you can finish about 1 to 2 artefacts, depending on how many keystones you buy/dig up along the road. So, since I'm permanently pessimistic, I'll aim for a single completed artefact. 120x141=16.920 minutes, <=> 282 hours <=> 11.75 days. Not exactly a farm to look forward to. Oh well! PS: All this is an estimation. Of course, there will be people that get the project on the first Tol'vir artefact they unlock, whereas others will never even see the claw. If there are any mistakes, do tell. Just got this as my 3rd Tol'Vir rare solve (pendant 1st, then ring). It's my 34th Tol'Vir solve, I think I got extremely lucky. On my 448th Tol'vir solve. Still no pet. I hate Blizzard for their stupid random system which is really %^&* and makes people to quite this game as some of my friends did. I'm at 87 solves while sitting on 2 rares. I have the ring and the scarab. Hoping for the pet next! I'm not sure whether I'll cry or cheer if the mount proccs instead. Just completed this pet today. It's my 3rd Tol'vir rare. Scarab, Ring, Claw. Hoping for the mount, which is my whole reason for doing Archy. I'm also an Alchemist with (4) Canopic Jar openings but no recipe. My stats once I FINALLY got this pet... why was I able to get the bug mount waaay before this! A number of people have commented on here saying "I have X number of solves and still haven't gotten it" only to return a few solves later, joyfully saying "I got it on solve number Y!" Currently sitting on 400 Tol'vir and 1442 Total solves with no luck yet. Got it after 35 tol'vir solves ;) lucky me. Just got this pet at 91 Tol'Vir solves, looks great with a pet biscuit. Funny fact about this one is, if you take it swimming, it will look like it's walking on water or it will Freeze-walk-freeze. 684 total solves - 90 Tol'vir solves - and no pet. Pendant > Ring > Scimitar, so far. I don't give a damn about the mount. seeing people with a ton of solves...this my 21st solve, 2 of the others were pendant of the scarab storm and ring of the boy emperor, guess the tolvir like me. Grinding is boring but it is something to do before raids or in between queues. Also, do it while watching netflix. I have 132 Tol'vir solves, this archaeology is my love hate relationship! I finally got this, it was after my 150 Tol'vir solve :) woot ! Got mine today after 150 Tol'vir solves. My previous Tol'vir rewards were (in order) the Pendant of the Scarab Storm, Ring of the Boy Emperor and Scepter of Azj'Aqir. YOU ARE THE ONE "INFLAMES" THAT SONG WAS WRITTEN AND MADE FAMOUS BY NONE OTHER THEN DEPECHE MODE. get your facts straight before you try looking cool with your phony emo rock taste in music. I am an aspiring pet collector; I have 136 and would like to reach 150 before the new expansion releases in a month. This of course is wishful thinking, but it hasn't stopped me. One day while I was doing arch, my boyfriend got on and joined me by doing his, too. Wouldn't you know that he got this companion instantly? He was laughing and apologizing, and I replied with that I would get his Uldum mount and Zin'rokh, Destroyer of Worlds. No surprise here, I got them after I said that. I spent almost a month once trying to gear my toon. It didn't happen. I had stuff taken from me by people who didn't need it; it wasn't fair, but I kept going. Weeks later, I convinced my guild to let me raid with them on that toon, since I would be fine once I had something other than dungeon gear. Funny thing, just about everything for me dropped in two lockouts and I got it all. I tried to gear holy too, would you believe that I spent a month (including countless dungeons) over trying to get just a pve shield? One Monday night, we raided before it reset. Our healers were druids and a priest, our dps were casters/ranged, our tanks were a death knight and prot/ret paladin... but there lied my shield. Practically there for me and only me. Sometimes I think that I won't get this pet. I then get 4~6 Uldum dig sites in a row, complete with a hieroglyphic or two dropping. So I encourage you to never give up. If you have that mindset, you will get whatever you want in life. And I promise you that it feels so much better once you finally do get it. Things happen, they get in the way; they make it seem like you are just not meant to do this, or get that, but you are perfectly capable of it, and you will find a way to get it as long as you keep trying. I promise. Going to keep going I guess. *sigh* Reading all these comments I don't feel too bad. I don't 'arch' in my free time. I think the last time I was bored I went for the mount and went from 0-126 Tol'Vir solves in a week, completing the Night Elf rares in the process (which of course doubled my Tol'Vir digsite pops). Now, with my main toon pretty much ready for MoP and his rare Fox Kit becoming commonplace with 5.0, I want a nice, interesting, rare new pet to have for pet battles. Cheers. Will update. How to get this and other rares. Focus on Vial of the Sands. I've gotten 4 rares already. This is my forth rare and my 25th solve. Got it on my 71st Tol'vir solve. Adding this info so others can determine an average number of solves needed. for the people that want to know the actually solve is called "mummified monkey paw" it requires 150 "tol'vir" fragments to solve and has 3 keystones=] happy hunting! Here's hoping the RNG Gods smile at me! Still no new rare from either. Got my final fossil rare (the shield) as my 290th solve! Got the scepter the same night as my 321st solve! Now for the pet! Tol'vir - 390 no pet, yet! Tol'vir - 450 still no pet :( getting a little depressing with two days left before mop. For pet battles this pet is insanely good. It's heal is on like a 2 or 3 round cooldown, it does good damage with it's basic, and curse of doom is pretty darn good to. This pet is a must. if that's true 500, i'm quitting now. i'm at around 50 for all besides orc/dranei/vyrkul/nerub I can't see myself handling another 450 finds without something.. . I got ring, scarab, mount.. mount at around 40. That's seriously way way too much if that's true. because I don't even know the hours i've already spent on this and i only have around 50 for those.. f'king ugh.. I hope my luck is better than yours.. if i make it to 100 solves without finishing, or at least getting the claw i'm dropping arch and f'ing cursing it till the day I die. couple away from night elf.. i think.. i forget, got the disappointing bones of rrr.. something, some bones :P or something haha.. yesterday. need the sword, there's a staff i think too? and the claw from tol'vir. haha, i read the guys post under me just now. The whole reason I started arch was the claw.. I got the mount.. it's pretty awesome heh.. honestly idk if i'd trade for it, ya, I guess when I started I didn't think of the mount as something i'd really want.. but now that I have it.. it's something I'm glad I got hah. It literally bound itself to my Wrist when i picked it up : / it was ever so troublesome to remove. After 74 Tol'vir solves the 75th was the mummified monkey claw, i.e. the crawling Claw. The rares were the ring, the scarab, the mount and then the Thing. The time between the mount and the Thing were 20 solves. Did it by grinding MOP sites, then turning them in for Tol'vir artefacts. Great this is just great. So there is hope for all that it won't take too long. See you at the pet battles. I leveled up my archaeology only for this pet and I knew I wouldn't get it for ages. I got the pet after only 4 solves. FOr the first time in my 8 years long WoW career I got lucky! I named mine "Three Wishes" in honor of the Simpsons halloween special with the evil monkey paw that gives them three wishes. When i get this pet these puns will come in ... handy. edit: Not a lot of Arrested Development fans around these parts, eh? Sheesh. Tough crowd. Wow... looking at some of these post, I don't feel so bad with my measly 120 solves. It's frustrating to turn in 580 restored artifacts all for Tol'vir and get the same crap over and over again. The only plus side is some of the rares sell for 200 and 100 gold but still, it's frustrating. I've had all the other rares done ages ago - mounts, pet, shield, robes, staff, scepter etc. I'll just keep plugging away and hope I get lucky. Looking at the model, it's a clear reference to the hands of humans. Been looking for this pet since I discovered it in the game. I leveled Archy for the express reason to acquire this pet. I've been digging for hours a day (sometimes all day) with no luck in this popping. As of this posting, I still DO NOT have this pet. I am posting merely to reinforce that there is no, I repeat, NO pattern to this. After speaking to some friends and reading other postings, I was convinced the rare solve "order" was scarab, ring, CLAW...wrong. I have gotten the scarab, I have gotten the ring...my excitement overtook me as I dug for the fragments and waited for my next rare to pop. "The claw," I kept telling myself. I then got the scimitar and just (about 10 minutes ago) got the mount. I'm a bit shocked I got a weapon and the mount before the pet, but this just goes to show that there is no order; all things are random. I have a total of 23 Rare solves (across all the different fragments) and this is by far thee most illusive and frustrating. I am convinced it is not popping because I want it most of all. However, my resolve remains...and I shall press on. My 85 Mage is 525/525 Archaeology and I want to farm Uldum for the Claw pet, but I can't get any sites to pop in Uldum. Every time I finish a dig and look on the continent map, I see 4 sites scattered over the continent (as always), but none in Uldum. I don't have MoP, but it shouldn't be required, since Uldum is Cata. Am I missing something, or do I need to do something different to get dig sites in Uldum ? Remember you can turn in Restored Artifact for Crate of Tol'vir Archaeology Fragments. You get these from solving Pandaria artifacts or buy with Spirit of Harmony. RNG for Tol'vir is horrible /bang head. Here is my story 138 Solves tolvir and still haven't seen my 3rd rare. I have completed many other rares on this toon figured it was string of bad luck. I decided to start tolvir on hunte today. He had only completed 4 rares total before digging tolvir sites. 3rd roll on hunter Scarabs pop this was similar to Dk. 17th roll on hunter Ring pops again similar to dk but here is where things didnt add up. Kept digging on dk figuring i would make his 3rd rare pop first to compare number at 138 rolls i got frustrated and said im going back to hunter. On Hunter his 34th roll he get his 3rd rare the staff. I dont know if its just random RNG or if the fact my dk has 23 Total Rares solved and my hunter only 4 but I started wondering if the total rares solved was factored into the chance on another to come up. Sadly after opening a ticket the gm couldn't confirm this said that info was only known by developers. Only reason I even asked because another thread on here stated a gm told him that it did matter. I call bs. They must have seriously increased the pop rate on Tol'vir rares. I got my mount, this pet, the ring, and then scarab thingy in less than 100 total solves (including all the initial solves I did when Cata released). --at least less than 100 according to the script someone posted on the scepter page. Never dig naked! Archaeology Helper addon makes the process significantly faster! Currently, I am able to reset my dig sites (most importantly, my Tol'vir sites) by changing zones or logging out/in. I suspect it is because I have a Mantid Artifact Sonic Locator in my bags. A google search confirms this *very* helpful bug. hi my account got hacked and i lose this pet, does anyone know if i can find it again? I wasn't sure this would've been the pet, but I didn't want to check websites and discover it wasn't, I just farmed more fragments and tried, it was the paw of a monkey, so could've been this. And when I finally completed it, the cast was "crawling claw", so done with archaeology except pandaria. Took long, but it's really satisfying when it takes so long for something. So 3 rares in around 50 solves, then 185 to get one more rare. Other thing: I have the feeling that the first 2-3 rares, depending on people, are much easier to find, so if you got unlucky and didn't get the pet, nor mount in the first 3, you may try to level another char on archaeology and get the first rares quick and see if you got more lucky. I didn't have archaeology on any other chars, else I'd have tried for sure. Is it possible to get a second claw if you've already farmed one ? This awesome pet reminds me of the Wallmasters and Floormasters in Zelda: Ocarina of Time. You know, those creepy giant hands that would fall from the ceiling and grab you, or split into smaller hands that would drain your life ? Not only was it left behind but it's also a Southclaw... er Southpaw. Just got mine today. I have been using my spirits of harmony to purchase Tol'vir fragments. I gave up long ago actually digging for them in the old world what with the only place to dig is Uldum. I considered giving up completely today and buy the one on the auction house for about 16k. First time I had seen one in quite awhile. Glad I didn't. Good luck to all who are still looking. Is that a fapping hand? I haven't seen this method suggested, but I think it's worth a try. Once you're exalted with the Lorawalkers*, you can use Mantid Artifact Hunter's Kit, which will make all Pandaria digsites mantid, so you can easily obtain many fragments for the same race; this is one of the fastest way to obtain Restored Artifact (the other one is to buy them for Spirit of Harmony, if you don't have other use for them). These can be traded in for Crate of Tol'vir Archaeology Fragments, so you don't have to fly around and solve all the Kalimdor digsites to spawn them in Uldum. *Using Mantid Artifact Sonic Locator while not exaltted with the Lorewalkers, you'll get the infamous 'You can't use that here' error message whenever you try to survey in digsites. Want to know how to get this FASTER? I've been doing it the hard way for so long! Yes, you can exchange your Spirit of Harmony for a Restored Artifact (Sold by Danky- Horde or Krystel- Alli) and then go to Brann Bronzebeard and turn that item in for Crate of Tol'vir Archaeology Fragments. BUT! I had the Mantid Artifact Hunter's Kit in my bag for sooo long. I thought "why would anyone need the mantid artifacts that badly? I want the Tol'Vir stuff!" Finally I decided just to use it to get it out of my bag and what I discovered led me to my Crawling Claw quicker! --The Mantid Artifact Hunter's Kit contains a Lorewalker's Map which is, arguably, kind of useless, and is consumed upon one use. But it also contains the Mantid Artifact Sonic Locator which is the real money. It basically (for 24 hours) puts all of your archeology dig sites in either Townlong or Dread Wastes in a tightly packed group. --AND, the haunts that sometimes pop up at dig sites award Mogu fragments which gives you even more opportunities to make artifacts. As high level archeologists we are no stranger to long flights, long digs, and slow turn around; but this method sped that process up which I'm sure we're grateful for. Anyway, needless to say this saves you from flying ALL over Pandaria to flying in a generally tightly packed and tiny dig sites. Yay! I've been trying to get this thing since Archaeology was first introduced, and still don't have it. I even buy crates of Tol'vir artifacts every time I box a Pandaria or Draenor artifact, and still no luck. For those who are still wondering, the "drop" rate is entirely random. I really wish it wasn't. First few rares appear quickly. This happened on two toons. Rares I want (claw and mount) simply won't come. Ridiculous number of solves and rares simply refuse to show up. I got this lil cutie today! I had 210 normal solves and 4 rare solves, taking my total to 214 when he popped up in my archaeology log. I finished all the achievements for all expansions from Mists, back to Vanilla. For every artifact I solved, I bought Tol'vir crates so I could keep solving Tol'vir artifacts without needing to do any archaeology in Kalimador. I started this journey when MoP was launched and continued on and off the whole way through that expansion and WoD. To those still on the journey - good luck! Such a bummer how you can't get this artifact solve more than once, yet you can get the same Garrison missions and non-rare solves as many times as you want. Doesn't make sense, especially since you can sell the pet. It would still take a long time to get it twice, and you'd still have to put in a lot of dig site work. They have nerfed the egg spot in Frostridge as well. No Charms. Yesterday 6/20/16 I got this hand. On my DK I had like 50 restored artifacts from draenor archeology but skill was low than 600. So to get rid of these. decided skill up my archeology. After 2-3 hours i was on 600 and began turn in restored atifacts to crate of tol'vir archeology fragments. Last rare drop was mummified monkey paw I never heared about this. Wow it was Crawling Claw yea It was realy luck too fast and suddenly. 413 solves to get this - still working on the mount.